Spectacle has been offering weekly video workshops on the Silwood estate, a continuation of our involvement in the local community since 2001. The aim is to creat community coherence and document the ongoing re-structuring and regeneration of the local area. This set of workshops was enabled by from The Capital Community Foundation and The Wakefield & Tetley Trust. 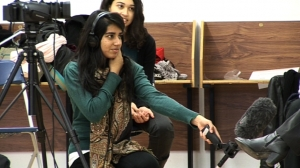 As part of our work with Well London, Spectacle ran media workshops with hands-on training in digital video skills and interview techniques. The final films documenting the Well London projects were in part filmed by participants of those workshops. Impact was a film workshop collaboration between Spectacle, Groundwork London and sixth-formers from Claremont School in Brent that co-produced an educational and energetic participatory short film aimed at young people to raise awareness about climate change and to simultaneously document their activities. 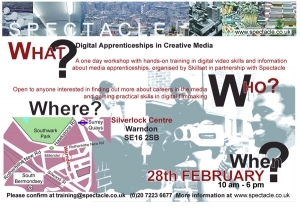 A free one-day workshop delivered by the Spectacle team offering hands-on digital video skills with a presentation from Skillset on the Digital Apprenticeship scheme. This workshop was aimed at people interested in a career in creative media through a recognised apprenticeship and anyone who wanted to acquire or improve digital skills. This is a Flickr badge showing public items from spectacle productions tagged with 280209. Make your own badge here.